He was Bob, Bob McNamara, taut, controlled, driving--climbing mountains, harnessing generals--the hair slicked down in a way thatmade him look like a Grant Wood subject. The look was part of the drive: a fat McNamara was as hard to imagine as an uncertain one. The glasses straight and rimless, imposing; you looked at the glasses and kept your distance. He was a man of force, moving, pushing, getting things done, Bob got things done, the can-do man in the can-do society, in the can-do era. You go to war with the press you have. This was certainly not war in the Jimi Hendrix era. Iraq was lethal, and no outsider could get around. The women, available everywhere in Vietnam, were off-limits here. There would be no romance, no high war writing. Instead it was all alien and remote. In these books, Iraq is hunkered down and hidden, its people and ways and language inaccessible to the writer-adventurers. (France had left its language behind in Vietnam, which provided Western writers with a kind of entry into the culture.) In Iraq the outsiders were on their own, captives of the Green Zone, of the "minders" and the interpreters. It was hard, practically impossible, to bond with the place. Shiism was not waiting to be deciphered or understood; Moqtada Al Sadr had no time, and no desire, to explain the origins of his worldview,his noble pedigree, the high clerical tradition of his family, to the American journalists in the bubble of the Republican Palace. It was enough for him that his devoted followers knew the magic of his lineage. The reclusive Ali Al Sistani, in his modest home on a lanein Najaf's souk, kept the invading power--and the press that came with it-- at bay. In one of my favorite anecdotes of Iraq, an American diplomat of considerable sway asked an Iraqi interlocutor what the term hawza meant--the word for a Shia study group and academic circle. "It's amazing," the Iraqi academic answered. "You send a huge army to this country, but you don't know the most rudimentary thing about its life." We had made our way into a land that had been hermetically sealed tooutsiders. We never had the slightest interest in Iraq. There were Americans who knew Beirut and the Palestinians; there were the expats, the oil prospectors and engineers who had bonded with the people of the Peninsula; and there came a time, in the 1970s, when Egypt was incorporated into the American orbit. The late King Hussein of Jordan had made his realm accessible and familiar tous--he even married a Princetonian. But Iraq had never figured in the American imagination, or in the American scheme of things. We were invading the most insular of countries. But invade it we did, and so we have to talk ceaselessly of Iraq. The travelers and the journalists and the talking heads make the obligatory visit to the Green Zone and return with a spurious authority. This was how you staked a claim to the airwaves; it was important to go over there if you were to be listened to over here. Iraq became a background, a credential. A kind of "non- aggression pact" was entered into by the instant experts: no one called anybody else's expertise into question. In this way, Iraq became the subject of some of the darkest hours in the history of expertise. We were on the lookout for the deficiencies of our soldiers and our bureaucrats in Iraq; but no one bothered to look into the limitations of our writings about Iraq. "We did not attempt to undeceive them," a sly French traveler on the Grand Tour once said of the honors attributed to him in the Levant. Our Iraq observers never attempted to undeceive us about the genuine state of their knowledge of that difficult place. The American audience was left to the illusion that the writers knew the language, or at least the culture, of Iraq. No one quite came forth and claimed fluency in Arabic--that carries risks in the age of the bloggers; but there was no harm in putting out an excited air of authority, an insinuation that the traveler had stepped into a world that he or she knew well. A word or two of Arabic could be pressed into the narrative. Above all, there was knowingness. This was enough to get past Chris Matthews and Tim Russert. Jolly Tim did not know about the hawza, and neither did his guests. We had taken the Iraqis out of the Iraq story, and we settled in for another bout of American narcissism--our deeds, our failures, our war. Ali A. Allawi's magnificent book arrives not a moment too soon. Here, finally, is a man of Iraq who knows its history and its wounds. He can write with deep understanding about its poets, its intellectuals, its clerics. He thoroughly grasps its peculiar place in its neighborhood, caught as it has been for several centuries between an Arab sense of belonging and currents from the Persian state to its east. A man of the Shia aristocracy--a cousin of Ayad Allawi, and a maternal nephew of Ahmad Chalabi--and a man of Baghdad, Allawi was marked for exile. His father had been one ofthe country's most respected physicians, and had served as minister of health under the monarchy. His family left Iraq after the Revolution of 1958, when he was a boy of ten. He was sent to boarding school in "deepest Sussex," then to MIT and Harvard. Hefound a big world outside Iraq, and financial success. But his country would continue to tug at him. Allawi was active in the politics of the exiles, and made his return to his homeland shortly after the destruction of the regime of Saddam Hussein. This was no carpetbagger who had come back for the loot. By all reports a man of exacting integrity, he has served, a tone time or another, as minister of trade, defense, and finance,and as a member of parliament. A man with a literary bent and a feel of his country's torments, Allawi has now come forth with a testimony that will endure. Away from home for decades, he brought with him what Leon Wieseltier once called the "stranger's wakefulness." But he is invested in his country's ordeal as no stranger could be. Essentially, it was based on the recognition by the Shi'a elite that they might have some share of central power, within limits that would satisfy the more ambitious of their leaders. But they should not aspire to control or run the state, even though their numbers might warrant this. At the same time, the state, dominated by the Sunni Arabs, would recognize and acknowledge the props of Shi'a identity, and would not move to alter or shrink them in anysignificant way. Essentially, the Sunni Arabs controlled the state, while the Shi'a were allowed to keep their civil, mercantile and religious traditions. It was a precarious balance, but it held the potential for improvement and progress towards a common sense of citizenship, duties and entitlements. Successive governments in the1960s and 1970s, however, foolishly destroyed this. The state removed the elements that kept a vigorous Shi'a identity alive in parallel to a Sunni dominated state. Nationalizations, emigration and expulsions destroyed the Shi'a mercantilist class; the state monopoly on education, publishing and the media removed the cultural underpinnings of Shi'a life; and the attack on Najaf and the religious hierarchy came close to completely eliminating the hawzas of Iraq. When the state embarked on the mass killings afterthe 1991 uprisings, Iraq became hopelessly compromised in the mindsof most Shi'a. The restraints of the ancien regime had given way. From afar, the exiles and the Anglo-American planners of the coming war talked ofthe modernism of Iraq and of the promise of its vast middle class. But the country of memory had ceased to exist. There had been, Allawi observes, something of a brief "golden period" of the middle class in the 1970s. It was a time of official brutality; but oil income had given Iraqis a shot at a new life. This was not destined to last. The 1990s- -the years of sanctions and hyperinflation--had devastated the bourgeoisie. Proud men and women auctioned off their movable assets to survive. There was amass exodus of professionals to any country that would have them. A"faith campaign" launched by Saddam Hussein when all was lost and compromised--a time of false piety, when the hijab spread in ever-greater numbers and a show was made against the consumption of liquor--hid the misery and the moral collapse. Some women, now heads of households as never before, were driven into prostitution. The pride of this country, a relatively advanced educational system, cracked. By 2000, a quarter of school-age children had given up on school, and children scrambled to help support eroding family incomes. By 2003, nearly half the adult population was illiterate.So the liberating power had its work cut out for it: it swept into a brutalized country. More problematic still, the past of this land was everywhere in its present. A past deeper and older than the sanctions, older even than the regime of the Baath, haunted Iraqis. Allawi finds his way into his country's temperament and its tradition through the work of Iraq's most distinguished and controversial sociologist, the scholar Ali Al Wardi (1913-1995), a U.S.-educated Shia writer whospent a lifetime trying to decipher his country's ways. Intuitive, anecdotal, dismissive of the statistical pretensions of Anglo-American social science, Wardi left behind a huge body of writings. Inspired by the work of the great fourteenth-century North African scholar Ibn Khaldun, Wardi believed that the process of urbanization, indeed modernism itself, was skin-deep in Iraq. For Wardi, and for Allawi after him, the country's turbulent history rested on a "pervasive dichotomy between the city, representingurban civilized values, and the steppes, representing the prevalence of nomadic, tribal values." Back and forth, Iraqis oscillated between the desert and the town. "The sense of the impermanence of the source of their values drove Iraqis into developing their noted schizoid qualities," Allawi observes. "The desert could actually or metaphorically encroach onthe city, while at the same time, the city could tame the desert by harnessing the country's waters and cultivating its soil." The struggle between town and country took on a special deadly meaning here, for it lay across the fault line between the Sunnis and the Shia. In Wardi's classification, the southern part of the country, the heartland of Shiism, was a settled urban world, while Sunnism, with its nomadic and tribal culture, was based in the western steppes of Iraq. The Anglo-American war planners were unaware of this history. But this was the actual country that awaited its foreign liberators. In Allawi's elegant summation: "When the Coalition arrived in Baghdad on 9 April, 2003, it found a fractured and brutalized society, presided over by a fearful, heavily armed minority. The post 9/11 jihadi culture that was subsequently to plague Iraq was just beginning to take root. The institutions of the state were moribund; the state exhausted. The ideology that had held Ba'athist rule had decayed beyond repair." In the best of circumstances, it would have been extremely difficult to repair this country and to hold it together. But Iraq was soon to become the battleground of an ideological war, and a turf war, between different wings of the American national security bureaucracy. The "realists" in the Central Intelligence Agency and in the State Department lost the early rounds, but they soon struck back. The victory that would come their way shortly after the fall of Baghdad would set the pattern of the American venture in Iraq. On May 6, 2003, as Allawi narrates it, George W. Bush announced that Paul Bremer would be the top civilian administrator in Iraq. Two days later, the United States and Britain announced that they were sponsoring a resolution that would grant them the status of occupying powers. On May 12, Bremer landed in Baghdad, the proconsul of an occupation regime. This, Allawi remarks, had come like a "thunderbolt out of the blue" to the Iraqi political class.The Iraqi leaders had expected a sovereign government of their own. But Colin Powell and the CIA had fought an effective rearguard battle: the "American project" in Iraq would be stripped of the ideological promise of an independent Iraq that would be a showcase for other Arabs. In no uncertain terms, Bremer would make it clear to the principal Iraqi leaders that his writ would run in Iraq, and that genuine authority was invested in him and in the Coalition Provisional Authority (CPA) over which he presided. But Bremer was no MacArthur, and this was not America in an age of self-confidence born of a great, decisive war. The American occupiers were not of one mind as to what ought to be done with this imperial acquisition. Wild- eyed schemes for remaking the country, recasting it as a bastion of free enterprise and participatory politics, clashed with bouts of reticence and the hard-boiled sentiment that Iraq was what it was and therefore was best dealt with through incrementalism. An old totalitarian bureaucracy soon found the cracks in the occupying powers' authority and knowledge. "The CPA did not demolish the state that it had inherited and then start torebuild it along the lines that it prescribed," Allawi writes. "This was the usual way of working in countries that had been totally defeated in war and then occupied. But the CPA insisted on keeping the form and most of the content of Iraq's government intact." The proconsul made sweeping declarations, but the Iraqi bureaucracy stalled and waited him out. In a telling metaphor, Allawi likens the CPA reforms to a demolition ball that struck a huge, decrepit building but unevenly inflicted minor damage on the edifice: "The foundations, and a considerable part of the superstructure of the dysfunctional state, remained." A huge amount of cash was sloshing around the country, and the old networks of corruption and inside dealing would reconstitute themselves in record time. This was the perfect playground for carpetbaggers and profiteers. A show was made of Iraq's independence, a transparent cover for the occupation with the formation of a Governing Council, a twenty-five-member body drawn from the exiles and the political parties that had staked a claim to the new order. Oddly, the American regency had no sooner midwifed this Governing Council than it set out to undermine it. It was said of this council that it was unrepresentative of Iraq, and thus would not be granted sovereignty or power. This was in part the bureaucratic imperative of the CPA; but the Americans had perhaps caught the bias in the Sunni Arab world against this body. In Amman, in Cairo, in the Peninsula, in the circles of the Arab League, there was a fierce hostility to the Governing Council. It was written off as a group of quislings and "collaborators." This was peculiar, for the entire region lay within the American orbit of power, and American security arrangements bound virtually all the ruling regimes to the Pax Americana. Yet the council, with a bare Shia majority, was singled out for abuse by the domesticated media of the Arab world and its satellite channels. When, in May 2004, an American-led raid on the home of Governing Council member Ahmad Chalabi took place, the play in Baghdad was laid bare. Chalabi had emerged over the preceding year as a relentless advocate of Iraqi sovereignty; but the American regency was bent on having its way. And beyond this raid, the shape of things to come had crystallized in the first year of the occupation: the CPA, for all its pretensions to absolute power, was being driven into what Allawi aptly describes as a "physical and psychological ghetto. "Outside the bubble of the Green Zone, a violent insurgency was taking shape. This insurgency was an affair of a thousand discontents: hostility toward an occupation, the anger of the Sunni Arab "supremacists" (a fitting word for the extreme elements in that community) at the loss of power, the desire for plunder and revenge, the conviction among the Shia that this was their chance to make the Iraqi state in their own image and to claim it forthemselves. It is the gift of Allawi's narrative that his is not merely a story of American incompetence or the CPA follies. (He leaves this to the self-regarding Americans.) For beyond Bremer and the "wet behind the ears" crowd that came with the occupation and quickly gave up when Iraq confounded or "disappointed" them, there were deep changes within Iraq itself; and they would in the end determine Iraq's destination. The ghost of Wardi would make its appearance with a vengeance: desert and town would descend into a new war. And this war would be fought in an Arab world where swords--and identities--were being sharpened and drawn in a new fight betweenthe old Sunni hegemony and the Shia outcasts now pressing for a newplace in the sun. We owe to Allawi a clear account of the impact upon Shia consciousness--and its subsequent radicalization--of the discoveryof mass graves during the first year of the occupation. The brutality of the regime toward the Shia, and the Kurds, was well known. But the mass graves--and the documentary evidence: the Baathists were meticulous about keeping record of their grim atrocities--were to "harden the determination of the Shi'a to carve for themselves a commanding role in the new Iraq." The estimates of the scale of the terror were not precise. Human rights organizations put the victims at 300,000, while the American estimates ran to 400,000. Either way, the psychological impact of these mass graves on the Shia sense of righteousness and violation was immense. These great crimes had taken place, the Shia knew, against the background of wider Arab indifference. The years since 1991, when Saddam's regime survived the first American-led war and turned its wrath on the Shia and the Kurds, had been a time of great terror. The Kurds had made their way out of Iraq, psychologically and physically; the Anglo-American coalition had secured for them a separate state in all but name. But the Shia had remained in the big prison, and what little traces of mercy and restraint existed in Saddam's domain had vanished. The psychological and physical terror unleashed on the Shia dwarfed the "traditional" brutalities of preceding Iraqi regimes. Moreover, the Shia who had taken refuge in Iran had returned with accounts to settle. In an important distinction, Allawi remarks that the Shia had been loyal to the country but not to the state. Now the country was to be made fully theirs. Power would drift tothe Islamists among the Shia; and men such as Chalabi and Ayad Allawi, Baghdad aristocrats with years of exposure to the West,would scramble to keep their place. The men of the Daawa Party--the party of Nuri Al Maliki, the current prime minister--came into their own. The Baghdadi Shia, heirs to an urban mercantile tradition, would cede their primacy to political men born and reared in the Shia heartland of the southern and middle Euphrates. In the decade of unrestrained terror that followed the first Gulf war, the life of the Shia seminarians had atrophied. Shiism had been pushed into the underground. The ulema, the jurists, who survived had opted for quiescence--the traditional taqqiyya, or dissimulation, of the Shia. But another current of Iraqi Shiism,bearing the brand of persecution, had been waiting for deliverance.In its zeal for hegemony, the regime assaulted the reed beds, the very ecology, of the marshes in the south. The Shia of the marshes sought shelter in Baghdad, in the slums that would become known as Sadr City. It was in this culture, and to this yearning for vengeance, that young Moqtada Al Sadr was to find his role. His father, an ayatollah who had arranged his own detente with the regime only to break with it, had been killed, along with two of his older brothers. Moqtada would take the gift of this American war, but without incurring any debt to the liberating power. Perhaps America came too late for gratitude on the part of theShia. The American betrayal in 1991 had already become part of the Shia narrative of righteousness and defeat. The chaos of Iraq after 2003 and the virulence of the Sunni attack on the Shia would give the Shia diehards their opportunity to push for their own utopia. In seclusion in Najaf, the Grand Ayatollah Sistani struggled mightily against these gale winds. He gave the presence of the coalition his tacit approval. He forbade revenge killings. He did his best to keep the poise of Shiism against the background of a relentless assault against his community. The young hothead Moqtada Al Sadr bristled against the controls thrown up bythe Marjiiyya (the official religious institution of the Shia jurists) of Sistani. He probed the limits of his community's religious and political order with attacks on Sistani for his quietism in the days of the terror and hints that the great jurist was an Iranian and so an outsider to Iraq, all of this balanced by professions of loyalty to the great man. The center of Shiism has so far held, though the Islamists have staked their claim to the spoils of power. The world of the Sunni Arabs was undergoing its own transformation. In a rational world, the Sunni Arabs might have let well enough alone; they had ruled, and had been cruel, and the crimes of the Tikriti despotism could be laid at their doorstep. In a world of reason, they might have traded their old privileges, and the chance for redemption offered them by the occupation authorities, for a place in the new Iraq, a role short of their old dominion but a place of honor and influence nonetheless. But this the Sunni Arabs would not do. They had the habits and the memories of power, and they had their sense of entitlement to it. They had the Sunni Arab states, and the jihadists--the suicidals, as they are called byIraqis--beyond and around Iraq spoiling for a war against the American infidels and the Shia heretics. The Sunnis claimed Saddam and did not claim him at the same time. For them, de-Baathification was synonymous with de-Sunnification. In the starkest and simplest of terms, the American war had robbed the Sunni Arabs of their primacy and their patrimony, and delivered it to the Iranians and to their "fifth columnists" within Iraq. Nor would the Sunni Arabs accept the basic arithmetic of the land. Theywere wedded to the legend that Iraq was a country of minorities, and that they, the Sunni Arabs, constituted a plurality of 42 percent of its population. There was a weird precision about that figure; national and communal myths always include a touch of precision. In no time, the Sunni Arabs would raise the standard of rebellion against the occupation. They had not been excessively pious, but their mosques now emerged as centers of opposition to the occupation. Fallujah, a town in the Anbar known for its religious conservatism--it is called madinat al masajid, the city of mosques--was the first to declare a virtual rebellion against the new order. Fallujah would become the stuff of legends; the Arab satellite channels outside Iraq would celebrate its heroism (as a few years earlier they had celebrated the doomed and pointless radicalism and violence of Jenin, in the West Bank). A full-fledged insurgency had "crystallized," Allawi writes. Yet the American regency was in denial. The mounting violence was written off as the work of "dead-enders" and former regime elements. "The insurgency began to gel in the summer of 2003." The infrastructure war began in earnest in the summer of 2003, aimed at creating a fuel shortage inside Iraq, reducing the revenue base of the country and impeding the supply of power to the public. The political advantages of such terrorist attacks would multiply as they began to reveal the inability of the occupying power to provide a basic level of services to the public." The Sunni Arabs had declared war against the new Iraq. By a "freak of history," Allawi says, a dominant order, the order of several centuries, was unnaturally overturned. Arab jihadists, misfits atwar with their own regimes in Jordan and Algeria, Saudi Arabia and Sudan--the unwanted of the Arab world-- made their way to Iraq to kill and be killed. The borders were porous, for the CPA had not fully secured them. The jihadists were deadly. But in truth, the insurgency had deep roots in the Anbar province and Mosul, and in the outskirts of Baghdad, which despotism had nurtured as a protective shield against domestic upheaval. "The insurgency was not inevitable by any stretch of the imagination," Allawi declares, "even though some form of on-going resistance would have been probable. But there was no reason why it could not have been contained, and possibly defeated, at its inception." (There is plenty of room for disagreement here. Perhaps the insurgency wasfated from the start, given the will to rule on the part of the Sunni Arabs; but then, too, the kind of punishment needed to thwart the Sunni Arab insurgency was not in the cards, given the deference shown by the Pax Americana to the Sunni Arab states around Iraq. )The Iraqi army and the security services of the old regime had not fought back; they had melted away and lived to fight another day. Given sustenance by a wider Arab world that had seen this new order in Iraq as an assault on all things Arab, the insurgents grew more brazen by the day. A year into the time of the Americans, the regency of Paul Bremer had run its course. In an astounding development that gave away the incoherence of the American enterprise in Iraq, the Bush administration sought deliverance through the auspices of Kofi Annan and an Algerian troubleshooter of his named Lakhdar Brahimi. The latter had been a functionary of the League of Arab States; he had never bonded with the Kurds or the Shia, and they in turn were excessively wary of him. Moreover, Brahimi, who made his home inParis, partook of the standard anti-Americanism of his political class. He looked with a jaundiced eye on the American war in Iraq,and made no secret of his views. His arrival in Baghdad was, to the Shia and the Kurds, a sign that the American regency, battered and shocked by the virulence of the insurgency and the hostility of the Sunni Arabs, was embarking on a compromise with the Sunni insurgents and their fellow travelers in the political class. "I ama U.N. man," Brahimi said in protest against the enmity that welled up among the Shia. He was entrusted with the task of choosing an interim prime minister and a government that would inherit the CPA. "I will not say who was my first choice, and who was not my first choice. I will remind you that the Americans are governing this country," Brahimi declared as he tipped the scales toward the old CIA favorite Ayad Allawi. On the face of it, Ayad Allawi was an attractive choice. He was the oddest of Shiites--a man with a bent for secrecy and an eagerness to assume and exercise power. His political beginnings had been in the Baath Party; he was tight with the security services in Jordan and Egypt. His political party, the Iraqi National Accord, drew from the Baathists who had fallen out with the regime of Saddam Hussein. His relations with the clerical institution in Najaf were correct but distant. He distrusted Iran, and made no secret of what he had in mind: a national security state in the Arab mold. For defense minister, he made an ill-fated choice: Hazem Shaalan, a Shia political man who staked out an uncompromising position against the Shia religious class and against Iran. This interim government made security its raison d'etre. It would fight inconclusive campaigns in Najaf against the forces of Moqtada Al Sadr, and in Fallujah against the Sunni insurgents. This was part of Ayad Allawi's message: that he was an Iraqi patriot not given to the call of sectarianism. 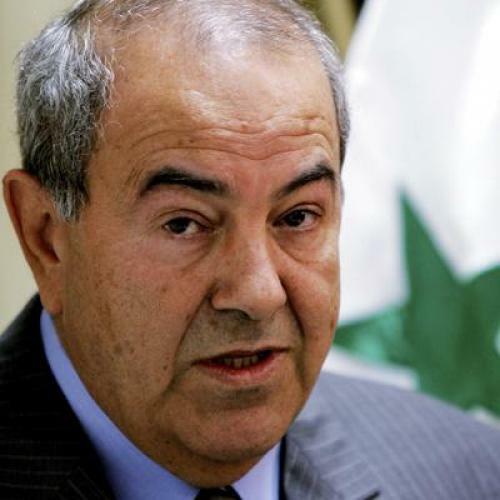 A man of the shadows--that is what Ali Allawi calls him--Ayad Allawi was not someone who thrilled to the cause of democracy. Left to his own devices, he would have called off the parliamentary elections scheduled for January 2005; he had the pretext of the security situation and the wide sentiment among the Sunni Arabs against turning out to vote. But he could not hold back the tide. Bush had made these elections a showcase of the war, and of its legitimacy; and there was also the odd democratic weight of Sistani, who had come to see the ballot as his community's way out of fear and marginality. Under the banner of Sistani, with the old man keeping his distance from the rough-and-tumble of politics, a big Shia electoral slate, the United Iraqi Alliance, was put forth. Ayad Allawi made his adjustment: he presented his own list to the electorate. It was known that the big Kurdish coalition--bringing together the two pre-eminent leaders, Jalal Talabani and Massoud Barzani--would claim the votes of Kurdistan. What remained to be decided was the balance between the Shia list and the forces arrayed around Ayad Allawi--the secular Shia, the old Baathists, the Sunni Arabs who dared defy the ban within their community on taking part in the elections. Ali Allawi writes that "Ayad Allawi was banking on the desire for order, security, Arab identity and material progress to push the Shi'a (and Sunni) voters in his direction. It was not a bad strategy, but it missed the zeitgeist." Ayad Allawi's national security state--a variation on Hosni Mubarak's despotism, a state built on security services and crony capitalism--was overwhelmed in the elections. Bloodied by violence, hemmed in by scarcities and material needs, Iraqis had grown attached to their democratic process and were touchingly proud of it. It was what they had to show for the violence and the ruin all around them. In the end, Ayad Allawi's state fell to venality and corruption. His defense minister railed against Iran and the turbans, but a huge scam--"the largest robbery in the world," in the words of a decent judge, the head of the Integrity Commission--was perpetrated in his ministry, a theft of public funds somewhere between $1.3 billion and $2.3 billion. Finance is Ali Allawi's specialty--this would be the portfolio he would assume in the government that would replace the interim cabinet of Ayad Allawi. Those with a taste for this sort of detail can find in his pages an exacting description of the networks of corruption and patronage that reconstituted themselves under the CPA and the brief reign of Ayad Allawi. And there is passion to spare in Ali Allawi's narrative of these scams: "Arab countries who shed crocodile tears about the plight of the Iraqi people did not bat an eyelid when a billion dollars plonked into secret accounts in their countries' banks." This American war had called forth a genie that the Pax Americana did not like: a Shia-led Iraq. And so the Bush administration recoiled from the verdict of its own war. The Shia secularists, men of privilege and education, were equally surprised by what transpired in their country. "The fulcrum of Shi'a opinion moved decisively towards a religious and communal understanding of their identity," Allawi writes, "leaving other considerations--tribal, political, or regional--to play a distant and secondary role, at least for the time being. Most Shi'a secular politicians, together with the US and UK governments, were in deep denial about this fundamental shift in the persona of the Shi'a of Iraq." The Shia underclass had risen; the pain and the ceaseless terror inflictedon them by the jihadists and their Baathist allies led them straight into their ancient, and now very politicized, faith. The important question now is whether the United States, under the pressure of a growing disaster, has finally accepted the Shia genie that it summoned. It was American power, direct and unapologetic, that pushed aside Prime Minister Ibrahim Jaafari in the spring of 2006. The United Iraqi Alliance put forth a man from Jaafari's political party and his social class, Nuri Al Maliki. A man of the hinterland with a strictly Arabic education, ill at ease with the Americans but eager to see his country through its torments, Maliki has entered into a marriage of convenience with the American occupation. When he signed Saddam Hussein's death warrant last December, he did it on his own, and in defiance of the American regency. For Maliki and his colleagues in the Daawa Party, the execution of the tyrant was an act of fealty owed to "the first martyr," Muhammad Baqir Al Sadr, who had played a signal role in the birth of the Daawa. It was hardly the only crime, or the greatest crime, for which Saddam deserved to be punished, but still justice was done. I once observed about Ali Allawi that Turgenev would have loved such a man, the "liberal" caught in an illiberal world. Allawi feels genuine pity for the Shia underclass, but he is not of them. He had come into a hard country. He was elected to the National Assembly in the elections of January 30, 2005, but he stepped aside from the elections held a year later. There is a formality, a reticence, in Allawi's book, and it is very much in the man. The pronoun "I" hardly appears in his text. It does, though, in his preface. "The new Iraq was held together more by the numbing repetition of platitudes and quick-fix nostrums than by any vision," he writes. "When the Interim Government offered me the ambassadorship to the USA, I could not bring myself to accept it. I knew that I would faithfully have had to represent and reflect the views of a government with which I might be frequently in disagreement." But he did serve as his country's finance minister. Now he is in and out of his homeland, the disappointment leavened by the destruction of a despotism that would have otherwise lasted many more years. It is true that the carpetbaggers and the profiteers have returned to Baghdad, and it is true that decent men and women have fled to neighboring lands, as waves of Iraqis once fled the terror of Saddam Hussein. It is certainly true that the sectarian violence in Iraq is excruciating, and a threat to all prospects of decency. And yet it is not nightfall that has descended on Iraq, but a savageand uncertain dawn. In those reams of sentences that reporters and travelers and outsiders have brought with them out of Iraq, my favorite remains that of a professional woman who declared that under Saddam Iraqis lived in a big prison and now they are in the wilderness--and that she prefers the wilderness. Ali Allawi rates this war as one of America's "great strategic blunders." That maybe, but all is not yet lost. The "neo- conservatives"--a bete noire of Allawi--may have simplified Iraq's truth, and some of them may have given up on Iraqis and despaired of them and said of them the most uncharitable things; but at least they held out the promise of Arab liberty, and broke with the notion that Arabs have tyranny in their DNA. President Bush's Wilsonianism may have erred on the side of excessive optimism, and may have come to him only after the hunt for weapons of mass destruction ran aground; but that is only the American side of this story. The Arab side is that modern-day Arabs had for decades been lamenting the cozy accommodation of American power to the forces of local autocracy. Lynndie England and Charles Graner were brutes and sadists, but tens of thousands of American soldiers had for Iraqis nothing but tender mercies. The terrible errors of this war can never smother its honor, and Ali Allawi is schooled enough in the history and the sorrow of his land to know that. A new history is offering itself to the Iraqis, and in the tale of disappointment that Allawi brilliantly narrates, there is still the furtive shadow of hope, an echo of deliverance, an undisguised sense of fulfillment at the spectacle of men and women released from a terrible captivity. Fouad Ajami teaches at the Johns Hopkins University School of Advanced International Studies and is the author, most recently, of The Foreigner's Gift: The Americans, the Arabs, and the Iraqis in Iraq (Free Press).